Fancy a Megadrive in your pocket? Sega used to be joint king of the consoles, until it spent too long resting on its Megadrive laurels before realising it had better do something. Unfortunately, that something was the Saturn, so now the once great console manufacturer just makes games (though some decent ones at that). 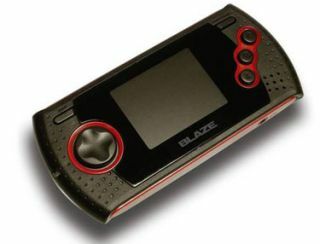 But for those of you desperate to go back in time (memory-wise, not actually) then the new handheld console from Blaze will transport you in an instant. Featuring OVER 19 games (20, actually), this little Game-Gear-a-like will allow you to play just like you're in the 90s all over again. Featuring titles like Sonic and Knuckles and Alex Kidd, this is one handset that is seriously playing the 'remember how good it used to be in the olden days?' marketing card. For crying out loud, at least get the proper Sonic games on there, and where's NBA Jam Tournament Edition? Anyway, it's only £29.99, though if you're that bothered then you clearly need to Google the word 'emulator'.